With John Wick, filmmakers have struck upon that rare combination of a great action movie series which gains natural momentum as the franchise progresses. Though obviously a big budget blockbuster, there’s just something a bit darker and cooler about the whole thing, making it much more palatable than the seemingly endless stream of superhero films and comic book adaptations. It also feels that, unlike the usual marketing for Hollywood films, John Wick seems to be attracting a lot fans through old fashioned word of mouth. Though filming is still underway for the third instalment of the series, photos shared from the set suggest the next film, entitled John Wick 3: Parabellum, is going to be the most epic one yet. In a new photo shared by Empire, the titular hero can be seen riding a black horse through the dark streets of New York, making a getaway from the city as he’s chased by someone on a motorbike. 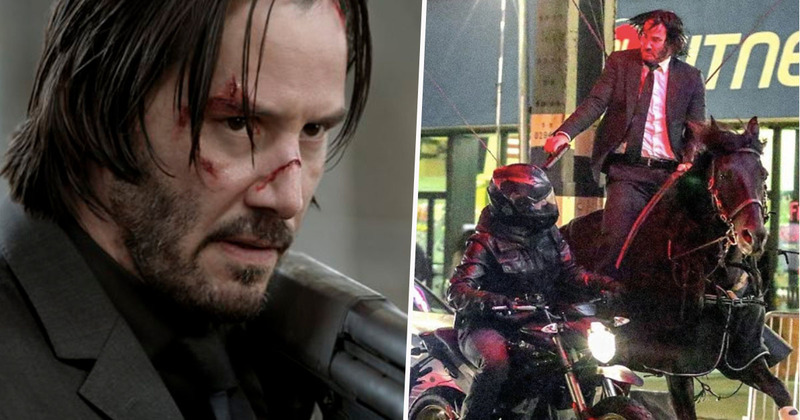 According to the film’s director, Chad Stahelski, Wick’s world in the new film will involve ‘horses, dogs, cats, a raven, a bunch of pigeons, a motorcycle chase, car chase, Halle Berry, Laurence Fishburne, Ian McShane, Lance Reddick, shotguns and ninjas’. And if that doesn’t get you excited for the part three, I’m not sure what will. Previously we’ve seen footage of Wick, played by the indomitable Keanu Reeves, riding a horse down a busy street while simultaneously holding a gun to someone’s head. That someone is also on a motorbike so, y’know, it’s pretty badass. The fact that Keanu is doing his own stunts also notches up the film’s must-see-ness pretty considerably, too. Though details of the plot of the new film are scarce, we do know some familiar – and new – faces will be making an appearance. Laurence Fishburne and Ian McShane are set to come back to the action-filled world of John Wick, reprising their characters of The Bowery King and Winston, respectively. The second John Wick film seeing Winston sparing Wick’s life, telling him he had an hour to escape, so it’s thought this is where the third film will pick up. Halle Berry will also be starring in the third instalment, taking on the role of Sofia, who is described as ‘a woman on a mission’. Speaking to ComingSoon, Keanu Reeves gave some insight into Halle’s new character. [Wick] is fighting for his life and thinks that Halle Berry’s character has some information for him. They have a past, and they get involved with The High Table, this kind of overlording entity. The 54-year-old actor also explained the film’s title – Parabellum – means ‘prepare for war’. And while we’re used to seeing Wick take out a decent number of people (he is an assassin after all), it seems the third instalment in the franchise could be the most violent yet.